My stomach grumbled while I was waiting for the start of the movie, There be Dragons. So, I decided to have a dinner just to silence my tummy. I was in Trinoma and I decided to visit the Jollibee branch located on the ground floor of the mall. I have visited Jollibee a lot of times and I already tasted the regular items on the Jollibee menu. I already tasted their chicken (two-piece or one-piece), burger yum, Jollibee spaghetti, and that macaroni soup. I even tried a breakfast item on Jollibee menu, which is the Chicken Sausage with Pancake. That night, I saw a meal item on the Jollibee menu that I haven’t tasted yet. That item is Jollibee’s Grilled Pork Tenders. Grilled Pork Tenders of Jollibee. I chose Grilled Pork Tenders as my dinner. It costs almost the same as the other regular meal item on the Jollibee menu. Grilled Pork Tenders lived up to its name. It is tender, which is perfect for senior citizens who already have weak set of teeth. Grilled Pork Tenders tastes sweet and peppery. Grilled Pork Tenders has a toyomansi (soy sauce with calamansi) dip but you can opt not to use the dip because the pork tastes well even without it. 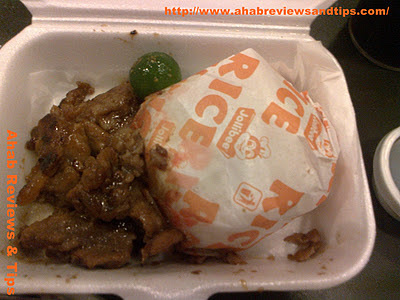 Grille Pork Tenders is another good addition to the Jollibee menu. I believe, however, that its taste is just a notch higher than your home-cooked grilled pork. Visit Before the Eastern Sunset and read my poem.